oh yes! I love her! You can click the picture for an even bigger view. This seems to clear up how "pink" she actually is. her feet look bigger than nefera's. I hope what I am seeing is real. I think you're right about that, especially since her bio seems so fixated on the fact that her feet are giant. I still don't love her. I hope the Exchange Students line up gets some good ones. I know it's supposed to be about the new characters and their cultures, but the only ones I like and plan to get are Lagoona and Draculaura. It would have been a cute detail to paint her nails. My sister pointed out one of the Ever After dolls has her toenails done, I think a Raven Queen. I tried to "color" my Color Me Creepy dolls but it was a LOT harder than you'd think. The toes were understandably hard but the fingers seemed to be even worse. When will she be released? 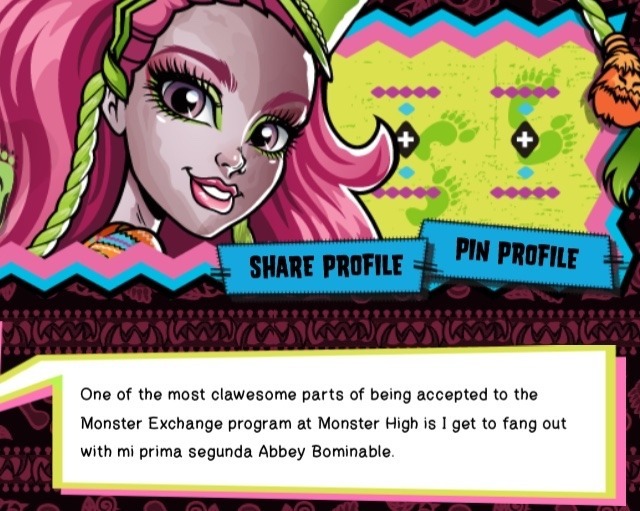 She is Abbey's cousin. Also doesn't anyone like the fact she is proud of her big feet and hair? I think that really reminds me of the beginning of MH. I'm hoping there will be some newbies that appeal to me. There always is, but it seems like next year's line up of Monster Exchange and Haunted Students is a let down in the ways of new characters. Usually I only skip one or two new characters, next year I only plan to get two, so far. That's how I feel too. I really want to see what other new characters are coming down the bend in 2015 as well. I still don't love her. I hope the Exchange Students line up gets some good ones. It did remind me of embracing your freaky flaws, which is what the beginning was all about, but her profile, maybe it's the writing, but her "embracing" comes off more as "egotistic" to me.